Oh, and I missed National Cookie Day. And probably National Chocolate Chip Cookie Day. And who knows what else? But guess what? I’m here now, and that’s what matters. I’m tempted to think, “Keep telling yourself that, girl.” But I had this in my queue. 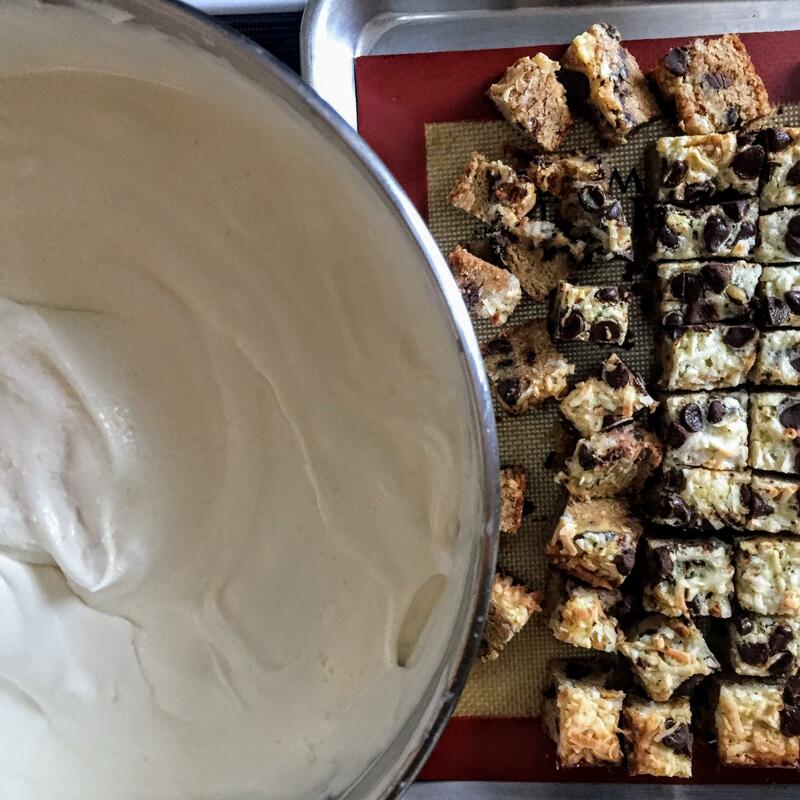 And because magic cookie bars are a quintessential part of Christmas cookie trays, exchanges, and binges, I decided to do a little holiday switcharoo and turn them into ice cream. So here goes rolling with the punches and making the most of the present. I tested this recipe in August for our church’s Annual Ice Cream Social. This event usually ushers in a handful of vanilla ice creams that promise to be unlike the others, some traditional favorites like mint chocolate chip, the “that’s-not-what-I-brought” folks who try to sneak their storebought ice cream into the lineup when no one is looking, and the likes of barbeque sauce or jalapeno chocolate flavored ice creams. Morals of the story include: Don’t be a lame. Taste at your own risk. Your ice cream IS a reflection of you and your character. If I were to interpret what this ice cream says about me, I’d tell you it reveals that trashing up recipes is the name of the game. Because *duh* it is. Unnecessary example to continue proving my point. Thanks to my homegirl, Jess, for helping me embrace my tendency and leading by example. 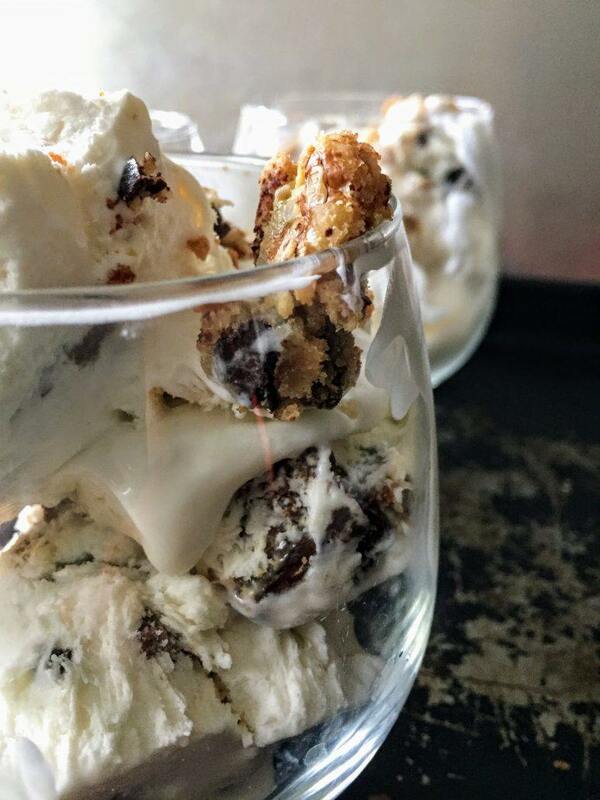 But for real, this recipe makes a big batch of ice cream and takes two stints in the kitchen: one to make the cookie bars and one to make the ice cream. There’s also a good deal of waiting involved. But maybe the creators of the Instant Pot will come up with something like the Instant Oven or the Instant Freezer! You know, for those millenials *and the rest of America* who CAN’T EVEN with waiting. Take a break from your cookie tray filling and trim up some ice cream with cookies. Everyone knows edible decorations are the best kind of decorations (looking at you, candy and graham cracker gingerbread houses). Maybe even leave ice cream for Santa. *Cough* Dried out sugar cookies lose their appeal after a while. Line the bottom and sides of a 9x9 pan with aluminum foil and coat with baking spray. Preheat oven to 350 degrees. Cream the butter and brown sugar on medium-high speed for 2 minutes until combined. Then add the egg and vanilla and beat until mixed together. Scrape down the sides of the bowl. On low speed, mix in the flour, salt, graham cracker crumbs, and baking soda. until uniform. Finally, add in chocolate chips. Press the cookie bar base mixture into the bottom of the prepared pan and bake for 5 minutes. Allow to cool slightly. 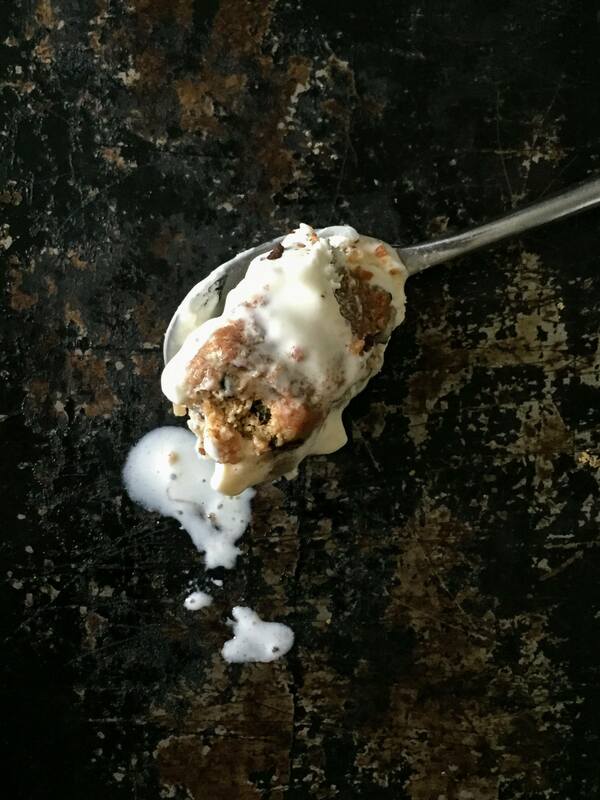 Drizzle half of the sweetened condensed milk on top of the cookie bar base, and then use a measuring cup to press half of the shredded coconut, chocolate chips, and nuts into the sweetened condensed milk. Repeat the process. Bake for 30 minutes, turning every 10 minutes to prevent the bars from browning too heavily. Once set, remove from the oven and allow the bars to cool completely. I allowed mine to cool overnight. Once cooled, cut the cookie bars into very small squares, about 1 cubic centimeter in size. 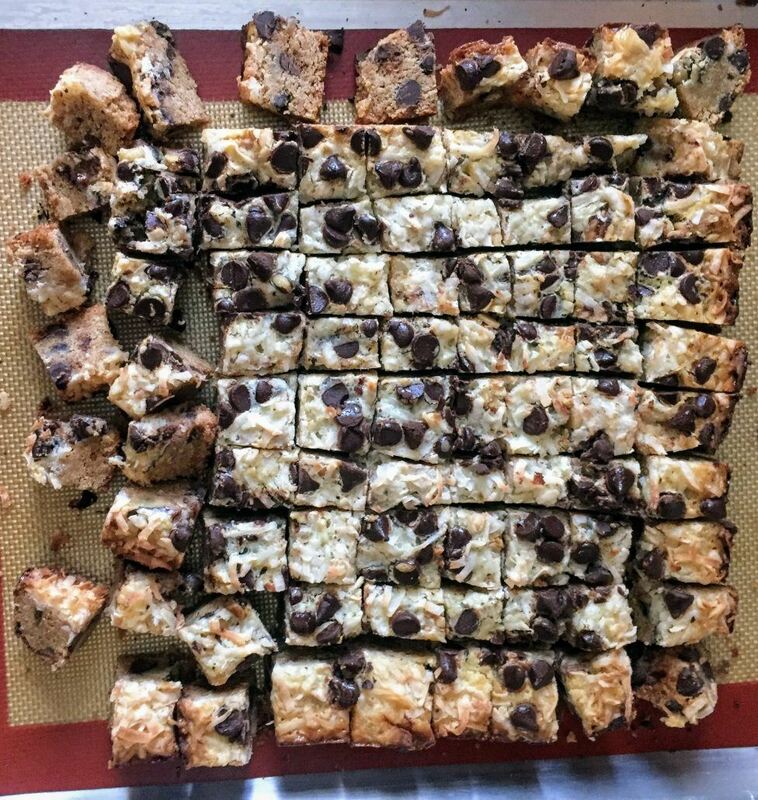 Cut the cookie bars into small squares about 1 cubic centimeter in size. The smaller the square, the better. To make the ice cream, chill a mixing bowl in the freezer for at least 5 minutes. Once the bowl it chilled, beat the whipping cream on high until stiff peaks are formed. Slowly fold the sweetened condensed milk and vanilla into whipped cream. Pour half of the ice cream base into a loaf pan or freezer-safe container. Stir in the desired amount of chopped cookie bars. Now, pour the remaining half of the ice cream base into the loaf pan and add remaining chopped cookie bars. I had extra magic cookie bars. Freeze ice cream for at least 6 hours. I like to refrigerate mine overnight.